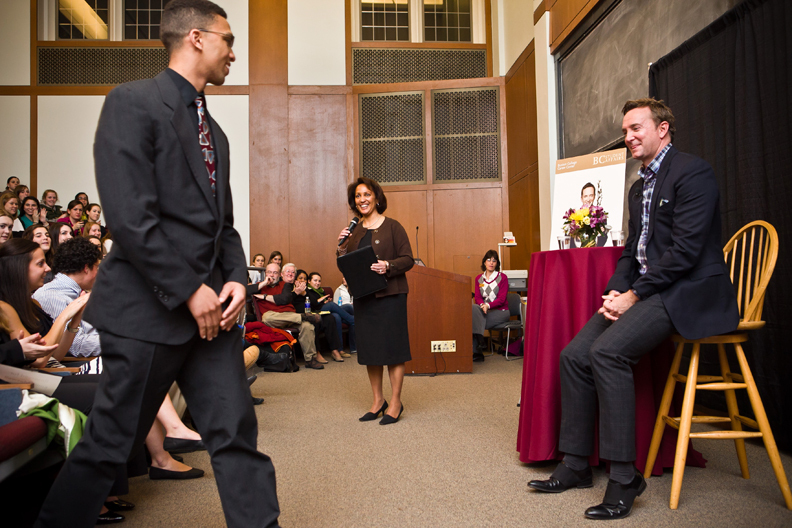 As planned, Kelly critiqued the interview attire of five undergraduate volunteers, among them Christian Bates ’14 (left). Kelly suggested that Bates swap the dark shirt for a white one and shorten the jacket sleeves to leave a half-inch of shirt cuff showing (Bates demurred on the latter tip, since the suit was his father’s). The event was organized by Janet Costa Bates, associate director of the Career Center (with microphone). Tuesday, March 15, the Center will host Science Night, an opportunity for undergraduate students to meet with alumni in the scientific fields. This feature was posted on Wednesday, March 2, 2011 and is filed under Featured Photo.